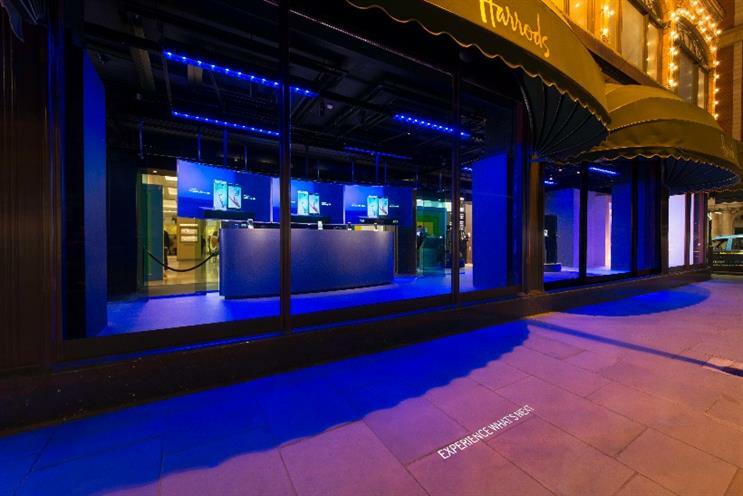 Samsung has become the first tech company to take over the majority of Harrods store in London, including its window displays. The 'Experience Innovation at Harrods' campaign will show off a range of Samsung gadgets, including its new Galaxy S6 and S6 smartphones. The display also includes white goods and kitchen accessories, and continues until 24 April. Alongside the window displays, Samsung branding will feature in the department store's interior, including digital screens and extra signage. There is an additional installation that shows off tech innovation over the last 25 years, including a number of Samsung products. Harrods customers will also have the chance to buy a limited edition platinum gold version of the Galaxy S6 Edge, which can be engraved. Ines van Gennip, marketing director, IT & Mobile Division, Samsung UK & Ireland, said: "Samsung prides itself on the quality and innovation of its products, and is constantly striving to match this with new ways of communicating with consumers. "Samsung knows that experience is the new form of luxury, and working with Harrods for this brand takeover was a fantastic way to capture the minds of shoppers."